So since January, I’ve been on the road in Germany again and this weekend there are 3 events waiting for you: a choir workshop for pupils and young folks at Ludwigsgymnasium in Köthen, open to all and free of charge. 3-6pm. It’s a prep workshop for my concert in Köthen on April 28. And then concerts on Saturday and Sunday in Gräfenhainichen and Stein (near Nürnberg). Just check my „live“ page for details and come by if you’re around! We are happy to announce that there IS going to be a release concert for my new album „FREIHEIT“: Monday, October 31, 2016. Germany’s very own reformation day! In Berlin, Kreuzberg at Emmaus-Kirche (see further details at „live“). 500 years ago, in 1517, 95 theses published by Martin Luther set the reformation in motion. But what does that have to do with today? Especially with those of us who don’t go to church? Well, Luther’s bible translation from the early 1600s was the foundation for the High or standard German we speak in Germany today. It was all about communication and cross regional understanding. The hearty, direct and sometimes quite radical Martin Luther and his contemporaries such as Melanchthon and many others were the radical trendsetters of their time. They set something in motion that had considerable ripple effect. Otherwise, we wouldn’t be singing together in church today. In our mothertongue (not latin). And there are other topics, such as daring to take a stance, following your conscience rather than human authorities, freedom from false bondages such as indulgences, and questioning tradition. What all of that has to do with Jazz and Soul? Well, just come and hear for yourself this October 31. We will play all songs from the album with full band, and I will reveal some secrets about the songs. Hello dear English-speaking, or should I say non-German-speaking fans. Let me update you on what has been happening since December, when this new homepage came online. Lots! Next to some band concerts all over Germany, in March I went to SPRING, a German family faith festival (much like Spring Harvest in Britain) to sing there and give a choir workshop. In June, I released the improvised worship CD „Love Song for the Nation“ with my dear friend and colleague Sebastian Bailey. All summer I haven been learning new songs in over 10 languages for the women’s acapella quartet Aquabella, of which I am a part since this August. But most importantly, I have been working on my newest album „FREIHEIT- Auf den Spuren Martin Luthers“ which could be roughly translated as „Freedom – following the tracks/steps of Martin Luther“. The CD was officially released this past Friday, August 26th. Now you can get it here in my Shop or at my live concerts, at itunes etc. I am afraid you will have to polish your German skills or ask some German speakers for the meaning of the songs. It’s all about reformation. We celebrate 500 years of reformation in Germany next year, in 2017. 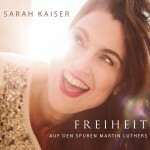 I was intrigued by this event, topic and concept and decided to both rearrange old songs by Luther and write new songs on the theme of reformation. Go ahead and order your copy of one of my 2 newest CDs and have fun discovering! And see you at one of my next concerts with Aquabella or my band. PS: The water pictures, by the way, were taken by the awesome photographer Sam Kim at Whiskeytown Lake in northern California. Do you see the shadows dance? Do you feel the sun is here? Will you come join in? Will you come and spin? And where, where have you been? Will you, will you come and spin? Dear folks, after a longer summer break this weekend starts fresh with some concerts: In Bad Doberan at the Baltic Sea you can hear me w my trio and participate in a Gospelworkshop I am giving there – should you be near there. And soon to come is a fresh paint on my website – new design coming up. here is the youtube video concerning the flashmob I talked about earlier. To date it has gotten more than 26.000 views on youtube – only a week online so far. So cool!